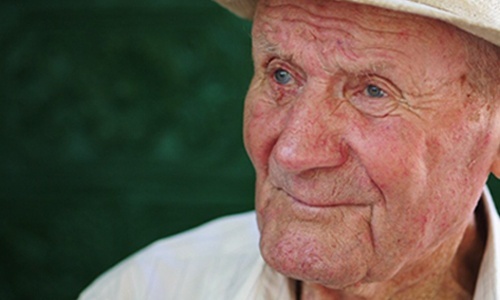 cognition and, at times, can cause seizures and symptoms of Parkinson’s disease like tremors. There is no cure, but AD can be treated with medications and supportive care. One additional risk factor is an person’s genetic makeup. The vast majority (~75%) of those diagnosed with AD have no family history of the disease. Instead, their AD is likely to be related to one or more of the risk factors above. But if someone has a first degree relative (parent, child, sibling) with AD, it about doubles their chances of developing AD (20-25% lifetime risk vs. 10-12%). About 25% of people who develop AD have a family history of the disease. This form, called familial AD, is separated into two categories: late onset and early onset. A person is a risk for late onset familial AD if he or she has 1 or more family members diagnosed with AD after age 60 to 65. This form accounts for about 20% of AD. It’s thought to be caused by multiple genetic factors plus environmental, diet, and lifestyle factors. 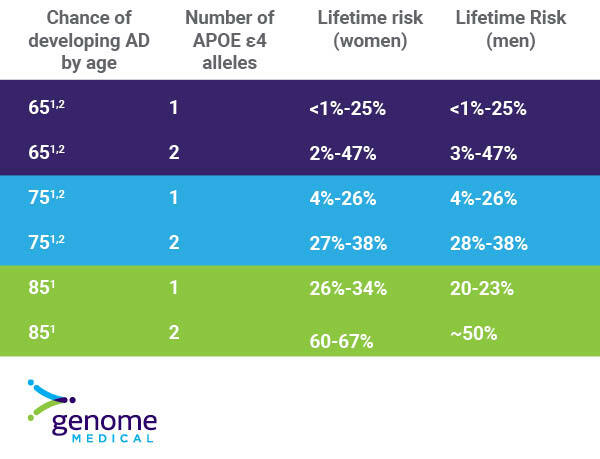 It’s important to understand that these risk numbers are just estimates — many people with one or two copies of the APOE ε4 allele never develop AD. This means that other factors in addition to the APOE ε4 contribute to late onset familial AD. Genetic testing for the APOE ε4 may be ordered to help confirm a diagnosis of AD, but it is typically not recommended to assess the risk of developing AD because of the unclear risks. However, some laboratories do include the APOE gene in their tests. Early onset familial Alzheimer’s is a relatively uncommon form of AD and accounts for less than 5% of all cases. This form is typically considered when two or more relatives have been diagnosed with AD before age 60. It is often caused by a single gene that is not working correctly (a gene mutation). At least three genes have been identified in early onset families: PSEN1, PSEN2, and APP. If an individual has a mutation in one of these three genes, there is a very high chance–but not 100%–that the individual will develop AD. What’s more, that person’s children, siblings and parents all have a 50% chance of having the same mutated gene (this pattern is called autosomal dominant inheritance). Genetic testing can be done for these three genes to help make a diagnosis of early onset familial Alzheimer’s. Although there is no cure for AD, some people choose to undergo genetic testing for the early onset form to help with early diagnosis or interventions, participation in clinical trials, family planning, and/or financial/insurance planning. have a conversation about the risks and benefits of genetic testing for AD. If you’d like to schedule an appointment to speak to a genetic counselor, get started here. If you (or your family) have a diagnosis or symptoms that may indicate a hereditary condition, like Alzheimer’s Disease, learn more about our Advanced Genetic Care program. If you have questions about the services Genome Medical provides, click the green chat box below or call us at (877) 688-0992.